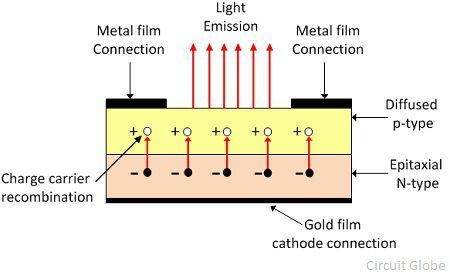 One of the major difference between the LED and the LCD is that the LED uses the PN-Junction diode which emits light when the current passing through it, whereas LCD uses liquid crystal or plasma for visible light emission. The liquid crystals are filled between the glass electrode and when the power is applied across it, the liquid crystal becomes energised and emits light. The other differences between the LED and LCD are shown below in the comparison chart. The LED and LCD both are used for displaying the images and texts. The LED using gallium arsenide and gallium phosphide which when heated emits visible light. The LED is used for showing the numeric and alphanumeric characters. On the other hand, the LCD has a thin layer of liquid crystal filament between the glass electrodes. When the power is applied across the electrodes they start emitting light energy in the form of photons. The LCD displays the text or images in the form of dot matrix and segments. Definition PN-Junction device which discharge visible lights when an electrical charge passes through it. It is an optical device used for displaying the information in the form of text and images. Backlight No backlight Cold cathode fluorescent lamp provides backlight. Material Gallium arsenide phosphide. Liquid crystals and glass electrodes. The full form of LED is Light Emitting Diode. The LED is a PN junction diode which emits light when an electric current flows through it in the forward direction. The LED is constructed by doping the p-type and n-type material. When the power is applied across the LED the recombination of P-type and N-type material charges takes places. The recombination of charges gives energy in the form of heat and light. The semiconductor material is translucent (allow light to pass) and it emits light through their junction.The semiconductor material used galvanised arsenides, which generates red or yellow light. It is also available in green, red, and amber colour. The several LED is used for representing the one segment and the decimal points are represented by the single LED. The LCD is used for displaying the texts and images in the form of dot matrix or segments. The LCD has liquid crystal filament which is filled between the transparent electrodes. When the current passes between the electrodes, the filaments become energised and emits visible light. The construction of liquid crystal display is shown in the figure below. The liquid crystal used in the display has the property of both the solid and the liquid. When the potential is not applied across the liquid crystal, it becomes transparent but after activation, the crystal scatters light in all directions and appears to be bright. The LCD consumes less power and also have seven segment displays. But it is a slow device and requires more times for switching.The dc reduces their lifespan and hence mostly they are used with AC having a frequency less than 500 Hz. The LED is a PN junction diode which emits visible light when the forward bias applies across it. Whereas the LCD uses liquid filaments which are filled between glass electrodes for the emission of light. The LCD uses cold cathode fluorescent lamp which provides the backlight of the screen, whereas the LED uses the PN-junction diodes for displaying the light. The backlight refers to the turning on and off of the displays for better vision. The resolution of the LED is much better than that of LCD. The resolution is the number of pixels on the display of the screen. The LED consumes more power as compared to LCD because of the plasma. The filament used in LCD is made up of plasma, which requires less power for activation. The display area of the LED is less as compared to the LCD because LED use PN-junction diode which displays light only in the one direction, whereas, the LCD display lights in all the directions. The cost of the LED is more as compared to LCD. The LED uses gallium arsenides which when heated emits light whereas LCD uses liquid crystals which are energised and provides light. The switching time of the LED is less as compared to LCD. The switching time is the active and deactivated time of their display. The direct current reduces the lifespan of LCD whereas the LED has no effect on it. The contrast ratio of the LED is less as compared to the LCD. The contrast ratio is the ratio of the luminance of the visible and darker light of the screen. The LCD uses mercury which pollutes the environments whereas the LED does not use mercury. The LED and LCD both are the modern technologies. But LED has more advantages than LCD and hence it is mostly used for making the displays.